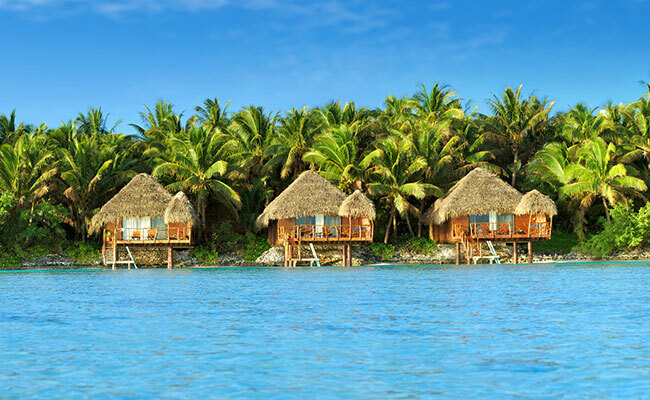 Not all overwater bungalows are created equal! From the deep azure waters of the Maldives, to the famed Bora Bora lagoon in the Islands of Tahiti, to the laid-back Cook Islands, here are our favorite overwater bungalow destinations in the South Pacific and beyond. They did it first, and many would say they do it best! The Islands of Tahiti, and especially the stunning island of Bora Bora, made the overwater bungalow iconic. In addition to extravagant overwater bungalows, the Islands of Tahiti are known for their romantic scenery, French-inspired refinement, and tropical relaxation. There are a plethora of resorts to choose from, many featuring overwater bungalows. Our favorite resorts include Le Taha’a Island Resort & Spa, St. Regis Bora Bora Resort, and the Sofitel Moorea La ora Beach Resort—just to name a few! Each resort features beautiful scenery, luxurious rooms and amenities, and beautiful traditional touches throughout. The Maldives is home to some of the world’s most beautiful beaches, deep blue seas, amazing reefs, and swaying palm trees. Here you’ll find a unique blend of heritage, culture, and modern living. You’ll also find some of the best overwater bungalows in the world. Many of the resorts are located on small, private atolls surrounded by their own reefs, which makes The Maldives a fantastic destination for snorkeling and diving. 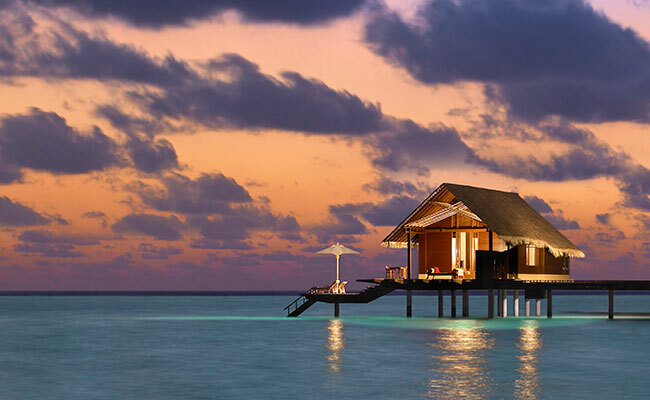 Some of our favorite resorts in the Maldives include One&Only Reethi Rah, Four Seasons Landaa Giraavaru, and Niyama (where you can dine at an iconic underwater restaurant!). Learn more about the Maldives and nearby African beaches here. 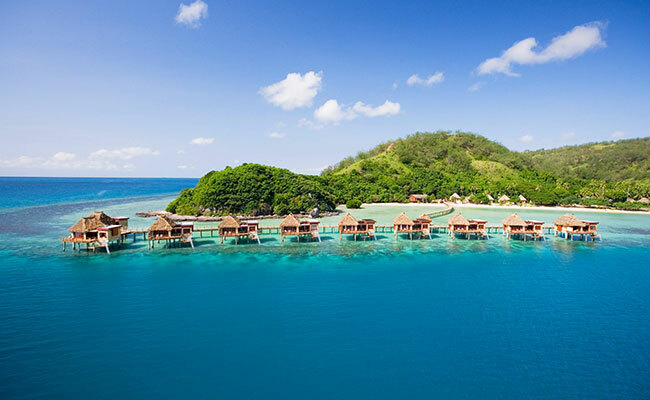 Our clients always ask us about overwater bungalows in Fiji. Surprisingly, the overwater bungalow trend has not extended to these laid-back islands very much; there are only a few options to choose from. Our top choice is Likuliku Lagoon Resort, located on a small island in the Mamanucas. This resort is absolutely beautiful and offers over-the-top luxury. Our clients always give rave reviews—one even said the resort was so beautiful, it made her cry! Our top choice for overwater bungalows in the Cook Islands is Aitutaki Lagoon Resort. With only 8 overwater bungalows, this boutique resort offers an intimate experience, and is the perfect place for those looking to visit a less touristed destination. 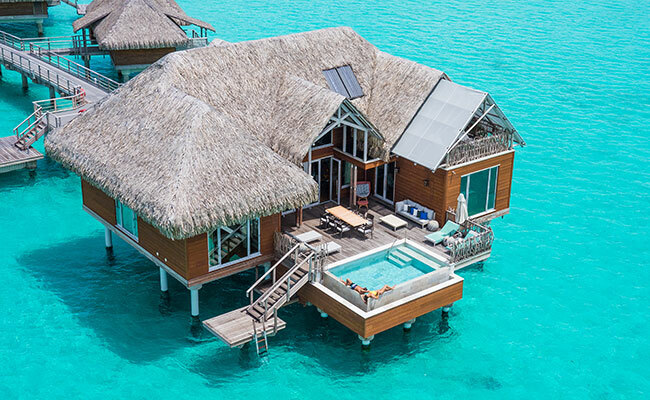 However, it’s worth noting that, unlike in other destinations, overwater bungalows in the Cooks are built partially on land with the front half extending over the water. You’ll see there are many different room categories to choose from in the Islands of Tahiti. Generally speaking, if you’re looking at an overwater bungalow, “Lagoon View” or “Beach View” means your bungalow will be facing the resort—typically not the most desirable view! Our Tahiti travel experts can take out the guesswork and help you choose the best option. At some overwater bungalows, the waters are tidal, meaning there will be times during the day you cannot swim out directly from your bungalow. Again, our travel experts will help you make the right choice! Looking for privacy? Get an “end of pontoon” bungalow. Although it does mean that room service will take a little longer, these offer the most privacy, as well as uninterrupted ocean views. When staying in an overwater bungalow, you can feed the fish through a window in your floor or in a table in your room. So be sure to bring some bread or crackers to share! Turn the lights on underneath your bungalow at night, and you’ll see nocturnal fish full of activity! Breakfast delivered by outrigger canoe to your overwater bungalow is a fun and romantic touch in the morning. Are you ready to start planning your overwater bungalow holiday? Give us a call at 888-229-0082, or check out some of our favorite luxury island and beach itineraries!